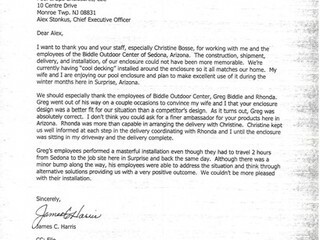 I want to thank you and your staff, especially Christine Bosse, for working with me and the employees of the Biddle Outdoor Center of Sedona, Arizona. The construction, shipment, delivery, and installation of our enclosure could not have been more memorable. We're currently having “cool decking” installed around the enclosure so it all matchs our home. My wife and I are enjoying our pool enclosure and plan to make excellent use of it during the winter months here in Surprise, Arizona. We should especially thank the employees of Biddle Outdoor Center, Greg Biddle and Rhonda. Greg went out of his way on a couple occasions to convince my wife and I that your enclosure design was a better fit for our situation than a competitor's design. As it mms out, Greg was absolutely correct. I don't think you could ask for a ﬁner ambassador for your products here in Arizona. Rhonda was more lhan capablein arranging the delivery with Christine. Christine kept us well informed at each step in the delivery coordinating with Rhonda and I until the enclosure if was sitting in my driveway and the delivery complete. Greg's employees performed a masterful installation even though they had to travel 2 hours from Sedona to the job site here in Surprise and back the same day. Although there was a minor bump along the way, his employees were able no address the situation and think through alternative solutions providing us with a very positive outcome. We couldn't be more pleased with their installation.